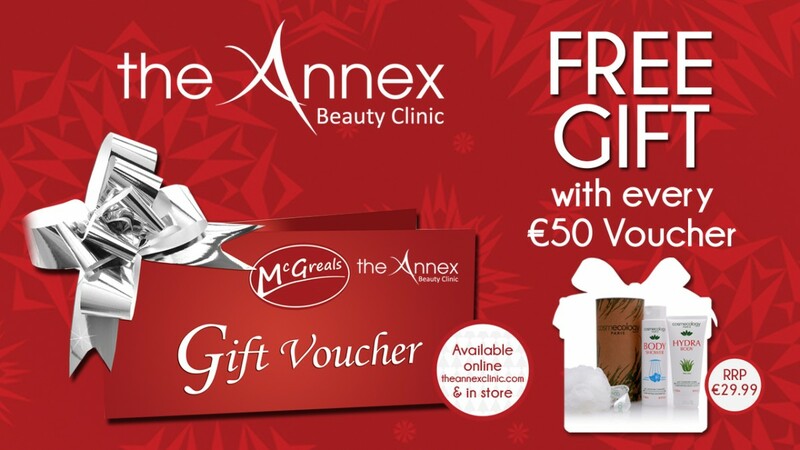 Give someone the gift of self-indulgence with the Annex Beauty Clinic & McGreals Pharmacy Gift Voucher. An extraordinary gift for an indecisive loved one, the Gift Voucher is the ideal solution to present finding-dilemmas. From the latest fragrances & cosmetics in McGreals Pharmacy to beauty treatments like massage, facials, nail treatments and much more in The Annex Beauty Clinic. We have a FREE Cosmecology Gift with a RRP of €29.99 to giveaway with every €50 Gift Voucher purchase. The Annex Beauty Clinic Gift Voucher is presented in a stylish wallet with a note for your own personal message.